Baan Phu Thara pool villas in Hua Hin are among the highest quality pool villas available for sale. This is the developer’s first developement. However, he was the sales manager for the very successful Orchid Palm Homes developments. Furthermore, the development is only 9 kilometres from the centre of Hua Hin town. Additionally, Hua Hin beach and all the facilities like Blu Port shopping mall, Bangkok Hospital, international schools and nightlife are closeby too. Also, there is a selection of high-end luxury pool villas to choose from. 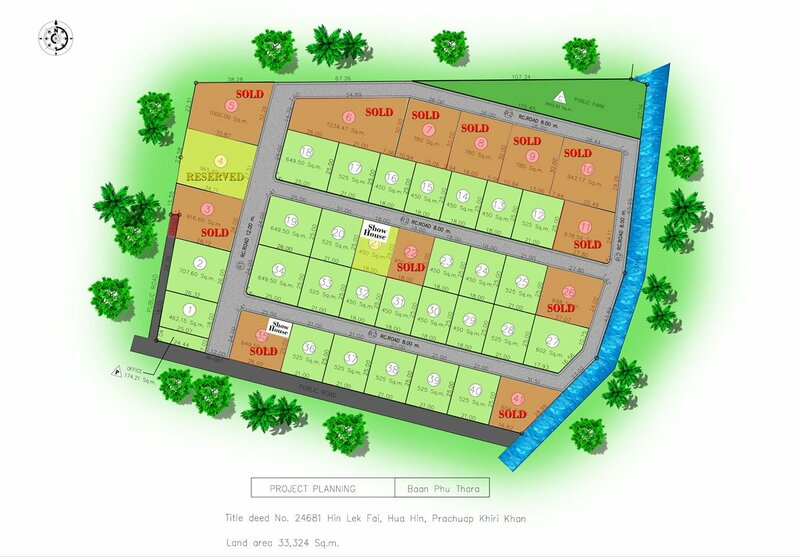 There are 41 plots in total, many with mountain and country views. Drive time into the city is around 10 minutes or so by car or motorbike. Baan Phu Thara pool villas in Hua Hin development is surrounded by pineapple plantations and coconut plantations. Baan Phu Thara pool villas offers the latest in cutting edge eco sytems. For example, community solar system, rainwater harvesting, UPVC double glazing doors and windows, LED lighting and automated emergency lighting, DC invertor air conditioning, above ceiling and roof insulation system and eco-friendly low energy swimming pool pump. Maintenance charges are 3,000 Thai Baht per month for 24 hour security, rubbish collection and upkeep of all communal areas. Optional fees for swimming pool and garden care are charged at 7 Thai Baht per square metre. Optional after the first 12 month guarantee period.